Mysuru : It was a veritable mini-India as youngsters from across the country came together to develop an understanding about the diverse social and development issues and also seek a common platform for cultural exchange. Over 130 youths from across 22 states participated in an eventful convention, where they danced, sang and sampled cuisine from other parts of the country. 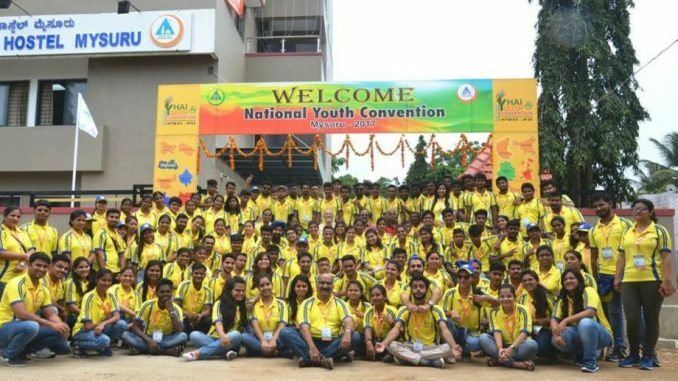 Non-profit organisation, Youth Hostels Association of India (YHAI), which works day in and day out for the development of the youth, provided such a platform as it conducted its first ever National Youth Convention earlier this month at International Youth Hostel, Mysuru, with the theme “Unity in Diversity”. Young participants from states including Andhra Pradesh, Gujarat, Goa, Karnataka, Madhya Pradesh, Odisha, Tamil Nadu, West Bengal, Rajasthan, Haryana, Delhi, Punjab, and Jammu and Kashmir, came together as they learnt to appreciate the diversity that is India. The action-packed week-long convention began on 12 September with a magnificent opening ceremony and consisted of an array of thought provoking sessions. It culminated with a grand closing ceremony preceded by beguiling cultural performances on 15 September. The underlying concept of the convention is India’s unity in diversity that one has always believed in as the country thrives in an amalgamation of different cultures, traditions, customs and varied ways of life. This very distinct feature helps our nation stand out in the global arena, the organisers pointed out, stating that at present, the world is going through difficult phase with many untoward happenings and as a country we can fight any evil, if we stand united. Peace and understanding is the need of the hour all across the globe, they asserted adding that youngsters play a huge role in shaping the future of this world. Above all, it’s quite pertinent to instill in them a sense of responsibility towards the planet, and teach them about the significance of peace and understanding, they said. Participants, clad in their traditional attires, representing their states, enthralled the audience with their fascinating cultural performances that included a traditional dance performance called KamsalePada, which is restricted to only Mysuru and Chamarajanagar districts; Riu dance of Chattisgarh; Goan traditional dance Fugdi; Gujarati folk dance; Rajasthan folk song; and Karagattam of TamilNadu. They also gave presentations about their state, culture, cuisine and traditions that helped each participant understand about each other’s cultures and traditions. Besides, the convention also hosted several educative interesting sessions, march past and flash mob near Mysuru Palace, as well as various stimulating events such as sessions on pertinence of Yoga, leadership skills, importance of youth hostelling in India and abroad, women empowerment and importance of overall personality development. National president Mohd Shafi Pandit commended all the participants for taking part in this convention and also appreciated the present leaders of YHAI for their effort in taking forward the organisation’s core philosophy of helping young generation to gain a greater understanding of the world and its people through hostelling and adventure activities. The non-profit organisation works for the development of the youth and promotes national and international understanding among the youth hostellers by providing budgeted accommodation and organising different activities on a no-profit and no-loss basis across the globe. Every year thousands of youth take active part in the national and international programmes. YHAI is an associate member of the Hostelling International, UK and conducts several activities such as trekking, mountaineering, nature study, family camping and sailing, to name a few. YHAI will host the next edition of National Youth Convention in Delhi next year and in Srinagar in 2019, said national treasurer Manoj Johri.